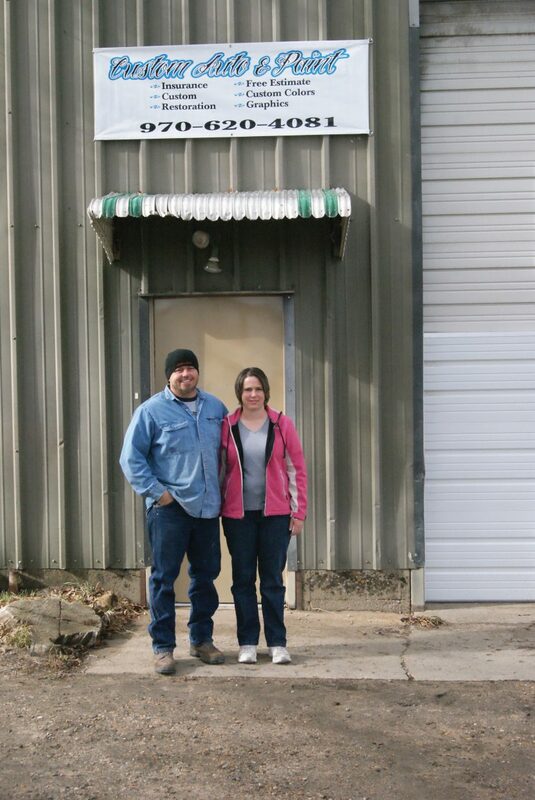 James Hand and his wife, Brenda, stand in front of their new shop, Custom Auto and Paint, 324 School St. in Craig. Craig — There’s a new auto body and paint shop in Craig. After a lifetime of working on cars, James Hand and his wife, Brenda, decided to open their own shop, Custom Auto and Paint, 324 School St. in Craig. Open since Nov. 1, Hand said business has been good. The couple has been in Craig for about five years, and Hand previously has worked for other body shops in town and at the mine for a while before deciding it wasn’t for him. After deciding to open up shop, it took a couple of months for the two to find a location and get it ready for customers. But now that they’re open, Hand said they’re ready for all kinds of customers, offering auto body work, paint, collision, restoration and custom services. Hand said he has state-of-the-art equipment including color matching, a booth and mixing wall. He also has a Web-based mobile estimating program, which allows him to go to the customer and provide an estimate. Hand said he’d like to work with his customers to help them pay part of their deductibles. Hand said he hopes customers will think of his shop as winter weather causes more car issues, not to mention the year-round issue of deer. The shop is open from 8 a.m. to 5 p.m. Mondays through Fridays, and Hand said he is considering staying open until 6 p.m. for those who need time to come in after they get off work. To contact the shop, call 970-620-4081.